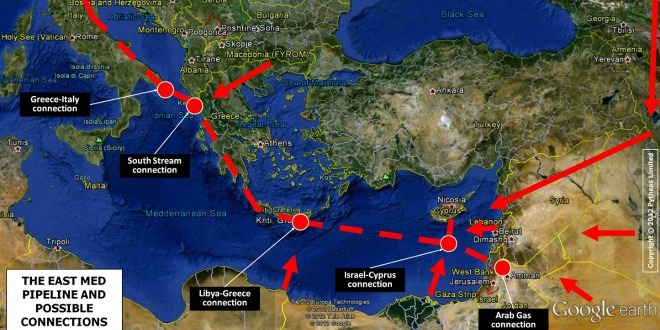 The EastMed gas pipeline from Israel through Cyprus and Greece to Europe is back in the limelight. It was reported on November 24 that the governments of Israel, Cyprus, Greece and Italy reached agreement on the construction of this pipeline based on the results of a feasibility study funded by the EU. The capacity of the pipeline to be 10-16 billion cubic metres per year (bcm/yr). Even though for the East Med region exporting 10bcm/yr gas is quite important, it is only about two per cent of annual European gas consumption. The EastMed pipeline so far has the support of the four governments and the EC, but no international oil company (IOC) or investor has yet expressed interest to join.The four governments and the EU cannot fund the project. This requires IOC and investor participation, and above all it requires buyers for its gas. IGI Poseidon states that the pre-FEED studies have confirmed the project to be technically viable, economically feasible and commercially competitive, but no details are given. The most challenging part of the project is its section from Cyprus to Crete, which reaches a depth of over 3000m. Laying the pipe to such depths is challenging – stretching the limits – but technically feasible. However, the terrain is very uneven and the area is seismically active, subject to landslides. This could pose integrity and repair challenges. The total cost of the pipeline has been estimated to be about $7billion, but most experts consider this to be optimistic, expecting it to be closer to $8-10bn. With initial gas quantities expected to be 10bcm/yr from the Levantine Basin, almost all of the gas will be from Israel. Phase 2 of Leviathan is estimated to add another 9bcm/yr to production, with all gas destined for export. Currently there is no indication on timing, but from the technical point of view Phase 2 could conceivably be operational by 2025. This is also the year IGI Poseidon expects the pipeline to be available to transport gas. If all of the Leviathan Phase 2 gas is exported through the EastMed pipeline there will be no room left for Cypriot gas, for example from the Aphrodite gasfield. In any case, if one is to rely on recent statements from Cyprus, Aphrodite is on the verge of signing an agreement with Shell to export its gas through the Idku liquified natural gas (LNG) plant in Egypt. Gas prices in Israel are high, with the cost of the gas expected to be between $4-5/mmbtu, even before it enters the pipeline. Allowing for the cost of the pipeline, by the time such gas reaches Italian consumers it will be too expensive. Europe is well-supplied with gas from Russia, Norway, North Africa, Qatar, the US and others. Europe’s gas demand is not expected to increase significantly in future, with the decline in indigenous gas production well-covered by Russian gas and LNG imports. The EC and Gazprom agreed in May “binding obligations on Gazprom to enable free flow of gas at competitive prices.” In addition, US LNG is well poised to increase its penetration of Europe’s gas markets. Most forecasts at recent gas and LNG conferences in Europe expected spot gas prices to come down and by the mid-2020s – when the pipeline is scheduled to be operational – to be about $6/mmbtu. At a Gas & LNG Summit in London in October, Gazprom confirmed it can sell gas at $4/mmbtu and still make money. In addition, US LNG companies are confident they will increase their sales to Europe at about $6.50/mmbtu. These are prices that EastMed pipeline gas may have to compete with if it is to secure export markets in Europe – a big challenge. In some respects, this project has great similarities with the ill-fated Nabucco gas pipeline project, abandoned in 2013. Conceived by politicians, with all good intentions, it proved to be a pipeline unable to attract commercial interest. Nabucco was created to carry Caspian gas into Europe by bypassing Ukraine and Russian gas, based on arguments of much-needed supply security. At the time, declarations by both Russia and the EU were that Nabucco and the then proposed South Stream pipeline – now replaced by TurkStream – were not competitors. But they were both designed to provide gas to the same southeastern European markets, where gas demand is comparatively limited. Conventional wisdom was that Nabucco failed for political reasons, but the real cause of its failure was the emergence of more economically viable pipeline proposals. EastMed was also conceived by politicians and is slated as a pipeline needed to provide Europe with much-needed diversification of supplies away from Russian gas. But Europe’s perceived need to diversify away from and cut dependence on Russian gas has, to a great extent, been negated by the May agreement between the EC and Gazprom. This imposed binding obligations on Gazprom, with the outcome of opening up European gas markets to cheap Russian gas, taking the edge off the need for diversification. Governments do not buy gas, companies do, for profit, and the biggest of these are already partnering Gazprom in its projects, such as Nord Stream 2. As a result, TurkStream 2 has now become reality, destined to supply gas to the same markets as EastMed but at more competitive prices – a deja vu with Nabucco and what led to its demise. And TurkStream 2 is not the only competition. TAP is well advanced and it is scheduled to deliver 8bcm/yr gas to Italy, and possibly to Bulgaria, by 2020. In addition, ENI has committed to increase the Zohr gas production plateau from 28 to 33bcm/yr by 2019, with the additional 5bcm/yr destined for liquefaction at the Damietta LNG plant in Egypt and export to Italy. All these projects will be delivering gas to southeast Europe much earlier than the EastMed gas pipeline. By the time the EastMed is built, the markets in southeast Europe are likely to be saturated with gas – in effect making EastMed unnecessary. So what is driving these governments, and particularly Israel which has been the most vociferous supporter, to pursue this project? A key factor is the challenge to secure export markets for the region’s gas, and perhaps through this gain wider international influence. If nothing else, the EastMed has brought Israel, Cyprus and Greece into a closer alliance, bolstering cooperation in a region fraught with conflicts. But at this stage the EastMed remains just a political agreement of intent, still far from reality. So far it has been easier finding gas in the region than exporting it. Israel has just announced a second offshore licensing round. Attracting IOC interest is highly dependent on its ability to export. Like many other EU-funded PCIs, East Med and Poseidon are facing challenges becoming reality. So far only 8 per cent of all gas PCIs have progressed to construction stage. In addition, the EU is now shifting interest from gas to supporting electricity projects. Moreover, with the relentless penetration of renewables, global energy markets are becoming increasingly challenging. Europe has just upped its 2030 targets for renewables and energy efficiency to 32 per cent and 32.5 per cent respectively. These will lead to that much less consumption of fossil fuels. Competition to secure markets will become increasingly fierce, with only the most competitive projects succeeding to secure markets. Will the EastMed pipeline be one of these?